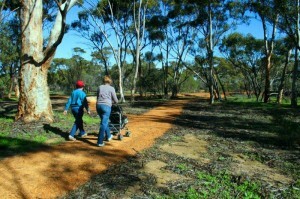 There are a number of walking trails to follow throughout the Eastern Wheatbelt from heritage walks, bush walks and rock walks. Located: off Connelly Parade, Corrigin. Points of Interest: Large water tank, Bushland, native flora & fauna. Caution: Parts of trail may be inaccessible following wet weather. No fires or motorised vehicles permitted. Dogs on a leash please. The trail features a diverse range of flora and fauna. The interpretation on site offers a great introduction to this aspect of the Wheatbelt. 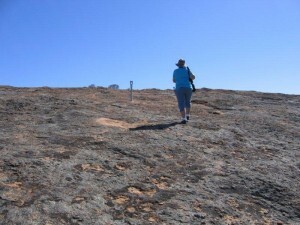 The trail leads from the Adventure Playgroung up onto the Corrigin Rock. Points of Interest: Views of farmland, Pockets of bushland with native flora and fauna. Starting at Rotary Tourist Park, this route takes in the main shopping areas of Corrigin. Degree of difficulty: Easy. Sealed roads and footpaths. This trail covers the edges of town and passes by the Corrigin Cemetery. Degree of difficulty: Easy, sealed roads, footpaths and gravel track. Located: on Redding Road, Dowerin approximately 100 metres from the Information Bay on Goldfields Road. Circular Walk (short): around 1.8 kilometres. Allow 45 minutes. Degree of Difficulty: Easy. No steep slopes. Caution: Take care crossing the Creek. Trail may be inaccessible following wet weather. Facilities: Barbecue facilities and parking available at the Information Bay.Toilet facilities located in Stewart Street (main street) a short walk north east of the Information Bay. No fires or motorised vehicles permitted. Dogs on a leash please. The trail features a diverse range of flora and fauna. The interpretation on site offers a great introduction to this aspect of the Wheatbelt. A World Wide Fund for Nature survey, conducted where Gimlet woodland merges with York Gum identified 48 native plant species including five recorded as bush tucker or for medicinal use. Echidnas, western grey kangaroo, goanna and a good array of bird life can be found in the area. A bird hide has been established overlooking a waste water wetland area. A map/brochure can be picked up from the Shire Office or the Visitor Centre located at the Community Resource Centre. The Dowerin Heritage & Recreation Walk Trail is a gentle stroll throughout the town site on a trail of discovery highlighting the culturally significant buildings & sites that Dowerin has to offer. A map is available about the Heritage Walk Trail and provides more information and stories relating to the use and development of each building/site for a further insight of pioneering history in Dowerin. Enroute visit our range of church buildings, the site of the original Dowerin Shearing Shed and the Dowerin Showgrounds, now famous for the annual Field Days. Seen the rock and wondering what to do next? Keen to explore the area a little further? Looking for a walk to stretch your legs before getting back onto the road? Then the Wave Rock Walk Circuit is for you! It is virtually flat and has a wide smooth surface, making it easy walking. The country surrounding Wave Rock is fascinating and the circuit will introduce you to a wide range of natural and cultural features. Fifteen interpretive panels have been installed around the route, to help you learn about and understand this intriguing landscape. You will stroll through salmon gum woodland, pass Hippo’s Yawn, cross salt (and gypsum) lakes in extensive boardwalks and get great “big picture views” of the Rock as you return. The Rock Trail takes you up onto the crest of the main outcrop, but it does so via a gentle climb, at first through the bush and then up the rock itself. Expansive 360 degree views are your reward for reaching the summit. The bush walk is just that – a “bushwalk”. Interpretive panels explain some of the intriguing plant species of this area, and give an insight into the nature of this landscape back at the time of J.S. Roe first visited over 150 years ago. The route is a gentle one, and should be accessible to all ages and fitness levels. A 2km walk around Merredin’s CBD looking at Merredin’s Heritage listed buildings, including Cummins Theatre, Merredin Courthouse and Townhall. Collect the Merredin brochure from the Central Wheatbelt Visitor Centre for a map of the trail including a detailed history of the buildings and their significance in Merredin. Located: off Benson Road in the Townsite of Merredin. It contains two interpretive walks which can be joined to become one longer walk trail. Degree of Difficulty: Moderate. The trail involves walking up and down two rock faces of moderate and steep slopes. Caution: Rocks may be slippery when wet. Wear suitable footwear. Take water, hat and sunscreen. Facilities: Parking for cars and caravans. Interpretation along the trail. This trail offers scenic views of the town and adjacent bushland as well as interpretation on how granite rocks were used as water catchments from the 1890’s. Water from the rock was collected via granite walled channels and feed into Railway Dam. From there it filled the water tower in town to supply the steam trains. Walking over the rock you look down on the site of World War 2 Army Field Hospital and over the town. Prospectors on their way to the Yilgarn Goldfields had their camps tucked away in the lee of the rock. An easy walk through bushland habitat this walk commences from the entrance to the Army Hopsital site. Allow 30-45 minutes . Up to 60 miutes if combine the Rock and bush trails. Degree of Diffculty : Moderate to easy. Caution: Take water in summer. Facilities: Parking for cars and caravans Dogs on leash only. This trail traverses a variety of habitats from Wandoo woodland to tamma thickets. 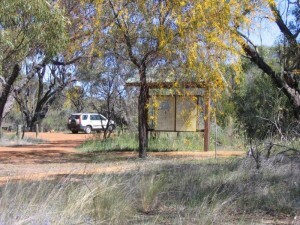 The bush to the east of the trail is the home of the rare Mallee Fowl. Kangaroos, echidna and a variety of snakes and lizards are found in the reserve while most of the common bush bird species of Wheatbelt can be seen seasonally over a year. This trail links with the Rock Trail or you can return directly to your starting point. A walk or drive trail covering parts of the remains of the Field Hospital that came from near Tobruk during World War 11 and went from Merredin to New Guinea as the theatre of war changed. Interpretive plaques . Degree of Difficulty: Easy. Allow from 30 minutes to 60 minutes to wander around the site. This can also be accessed by a drive trail. Towing of caravans or large mobile homes not recommended to take the Army Hospital Drive Trail. Facilities: Parking for cars and caravans. Facilities: 2 picnic tables and 6 interpretive signs. Tamma Parkland provides a glimpse into the type of vegetation that was once found in the area. The 23 hectares is home to 175 native plants in five habitat sites. Over 45 species of birds have been sighted in the Park. In spring time droseras, a variety of orchids, grevillea, hakea and the mallee trees are all a feature of the Park. Degree of Difficulty: Easy to moderate. At the Hunt’s Well parking bay there is a disabled access pathway that leads to the rock wave. Suitable for wheelchair access and those who are unable to walk up slopes. Facilities: Parking for cars and caravans. Picnic tables. Interpretation Bay. Dogs not permitted. A day use site only. Camping not permitted. 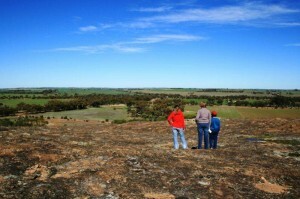 Walk over an undulating granite rock with lovely views of the surrounding bush and farm land. This trail is an excellent introduction to the geology of the granite rocks of the Wheatbelt and the flora and fauna that live on or adjacent to them. The rock features a mini “wave” and you are told how these features form. The stone lined Hunt’s well is one of a series of watering points developed by the explorer Hunt throughout the area. The bushland surrounding the rock is a picture of wildflowers in the winter and spring with orchids and everlastings adding to the perennial species. For those who are unable to take the rock walk you can see the mini ” wave” by parking in the Hunt’s Well carpark and walking up the trail to see the well. Walk further west towards the rock and you will come out at the wave feature. An easy stroll of some 500 metres with wheel chair access. A 4.6 kilometre walk around the townsite of Mukinbudin. The trail starts at the botanical garden where there is a rare and endangered walk showcasing local flora which then extends out into the recreational trail. This trail has markers at strategic points. The markers are a small round sign with a figure walking. Around the trail various equipment has been installed. Four lifestyle stations have been installed at intervals for your use. Seating and two water fountains are available along the trail. You are more than welcome to walk dogs along the trail providing they are on a leash. It is asked that owners remove any of their pets excrement. At both water fountains dog bowls are provided for pets to drink from. Trail Starts: South of the Westonia Caravan Park, on Wolfram St. Points of interest: The Westonia Common features many flora and fauna species endemic to the WA Wheatbelt. 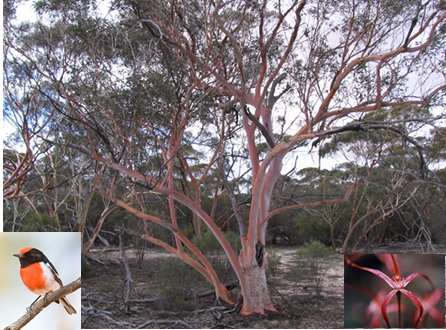 The three main Wheatbelt Woodland species Salmon Gum, Gimlet and Red Morrell are a crucial part of the Westonia Common and are prominent along the Walk Trail. During spring wildflowers such as everlastings and various Orchid Species including the Spider and Donkey orchids are prevalent throughout the trail. You may see evidence of our resident Echidna’s or Malleefowl and many more unique birdlife such as the Red-Capped Robin or the Tawny Frogmouth Owl. Best Times to Use the Trail: We recommend walking the trail from August to November to take advantage of the spring conditions and view wildflowers, everlastings and orchids. However throughout all seasons of the year, the bushland is constantly changing, with spectacular seasonal changes represented in changing bark, leaf colour and flowering of different perennial plant species during the seasons. Early morning walkers will see an abundance of birdlife active in the early hours of the day.